Update: Motorola's Alexa-imbued MotoMod will be available starting November 13 in the US on Amazon, Motorola's own website and Best Buy. 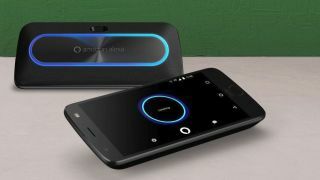 Motorola has announced the latest MotoMod for its Moto Z family of handsets - the Moto smart speaker with Amazon Alexa. Priced at £99, $149.99 (around AU$160), the snap-to-connect mod features its own dedicated speaker and familiar blue illumination ring that owners of the Amazon Echo or Echo Dot will be familiar with. Motorola says you'll be able to buy the speaker with Amazon Alexa from Amazon and its own website in the UK, US and Germany from November. The Mod will allow you to trigger the smart assistant with your voice without having to even touch your handset, and results (if necessary) can be displayed on the phone's screen. It also features its own battery, which Motorola claims will give you up to 15 hours of use, so you shouldn't need to worry about it draining the phone's battery.